Rolling of steel consists of passing the material, usually termed as rolling stock, between two rolls driven at the same peripheral speed in opposite directions (i.e. one clockwise and the second anti-clockwise) and so spaced that the distance between them is somewhat less than the thickness of the steel section entering them. In these conditions, the rolls grip the material and deliver it reduced in thickness, increased in length and probably somewhat increased in width. This is one of the most widely used processes among all the metal forming processes, because of its higher productivity, close control of the rolled product, and lower operating cost. Rolling is able to produce a product which is having constant cross section throughout its length. Many shapes and sections are possible to roll by the steel rolling process. Rolling of steel is a metal forming process used for plastic deformation of the steel. Plastic deformation is caused by the compressive forces applied through the rotating rolls. High compressive stresses are as a result of the friction between the rolls and the surface of the steel material. The steel material gets squeezed between the pair of rolls mounted in a roll stand, as a result of which the thickness of the steel being rolled gets reduced and the length is increased. Steel sections are generally rolled in several passes, whose number is determined by the ratio of initial input material and final cross section of finished product. The cross section area is reduced in each pass and form and the size of the rolling stock gradually approach to the desired profile. Mostly, rolling is done at high temperature, which is called hot rolling, because of requirement of large deformations. Hot rolling results in a rolled product which is normally residual stress-free. However, scaling is a major issue during hot rolling, due to which it is difficult to maintain the dimensional accuracy. The final dimensional quality of the rolled product is determined by the rolling stands within the finishing mill. The dimensional accuracy in the final product depends on many factors including the initial stock dimensions, roll pass sequence, temperature, microstructure, roll surface quality, roll and stand stiffness and the rolling stock/roll friction condition. A rolling mill is the place where the rolling of steel in carried out. It consists of one or more rolling stands along with some auxiliary equipment where auxiliary operations associated with the rolling of steels are performed. Rolling of steel in small and medium sized rolling mills is generally carried out in cross-country rolling mills. The rolling mill is called cross-country rolling mill because of arrangement of the roll stands. In these rolling mills, the centre lines of the roll stands are parallel to each other and the material being rolled is shifted perpendicular to the rolling directions. Transfer and skid tables are used in these mills to reverse the direction of travel of the work piece and convey it from one set of roll stand to other. One of the characteristics of the cross country mills is that the work pieces must be short enough so that one piece can leave a mill stand before another is transferred to it. In a broader sense, a rolling mill consists of a set of roll stands along with a series of equipments which performs both rolling and auxiliary operations. The steel material to be rolled is transported from the stock to the reheating furnace where it is heated to the rolling temperatures. The different operations being carried out in a rolling mill consists of (i) rolling of the heated steel material in the mill, (ii) transferring of the material under rolling from one roll stand to another, (iii) turning or twisting and shearing of the material in case of some mills, (iv) transporting the steel product after rolling, (v) cooling the rolled material on cooling bed in some mills, (vi) cutting, marking or stamping of the rolled product, and (vii) trimming, packing, and conveyance to the stock of finished product. 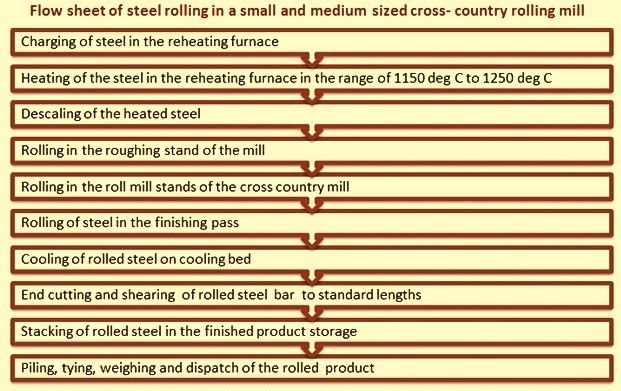 The process flow sheet of rolling in small and medium size rolling mill is shown in Fig 1. Cross country type of mill lay out is used for rolling mills having low capacities. This lay-out is generally adopted because of the limited space available for the mill. Cross country type of mill lay-out limits the maximum length of the steel product which can be rolled from the mill. Cross country mills are hot rolling mills normally used to roll shaped steel products such as rounds, squares, flats, or sections etc. The shaped steel products are usually known by a common name which is the ‘long products’. A rolling mill of cross country type consists of several roll stands so arranged that the work piece is never in more than one roll stand at the same time. Since the roll stands are located side-by side, the work piece is transferred laterally to the roll bites of the various stands. In many of the cross country mills, the rolling of work piece takes place in both the directions. In such mills since the direction of rolling is changed after each pass, it has a positive effect on the quality of the rolled product. At each pass there is a reduction in section and a corresponding increase in the length. This means that there need to be facilities available to take the longest piece of steel at the each stand and naturally this applies to both the sides of the mill. There are limitations to the maximum reduction which is possible to be achieved in a cross country mill using a single drive, especially when it is designed so that there is more than one piece of steel materials being rolled in the rolling mill at a time. Hence, the size of the ingoing steel material is normally fairly small. Further in such mills, the two high stands can be set in a manner so that the upper roll of the first stand corresponds in height to the lower roll of the second stand and so on allowing the piece to be processed backwards and forwards alternately along the stand line. If there is a combination of two high and three high stands in the same cross country assembly, the centre roll of the three-high stand corresponds to the driven roll of the associated two high unit. An alternative arrangement is for the cross-country stands to be preceded by a single roughing stand in which only an odd number of passes (say 3 to 5) is taken and then the steel can be passed into the cross-country stands. This layout can also be used to roll input material of higher cross section. In cross-country rolling mills, like in any other hot rolling mills, rolling is done above the recrystallization temperature of the steel material. During rolling in these mills the grains, which deform during the process of rolling, recrystallize, maintain an equiaxed microstructure and prevent the steel material from work hardening. In this type of rolling, hot rolled steel product has very little directionality in the mechanical properties and deformation induced residual stresses. Long products are normally rolled in several passes, whose numbers are determined by the ratio of the cross-section of the initial input steel material and final cross-section of finished product. The cross-section area is reduced in each rolling pass and form and size of the steel material being rolled gradually approach to the desired profile. The roll stands used in a cross-country mill are either two high stands or three high stands. The cross-country mills are normally made up of several two- high stands or three-high stands, or a combination of both. A two high roll stand has two rolls in it. One which is on top is known as top roll while the other is known as bottom roll. In two high stand mills the rolling is only in one direction. In case of rolling in reverse direction, the mill is to be reversing. In case mill is not reversed then a pullover type two high stand is used. In this case the steel material after rolled in a pass is transferred to feeding side generally over the top of the rolls for further rolling in next pass. In three high roll stand there are three rolls consisting of top roll, middle roll, and bottom roll. The steel material is fed in one direction through two of the rolls and then reversed through the other pair. The middle roll is common in each feeding. Three high roll stands are used to reverse the direction of the steel bar being rolled without reversing the direction of motor and gear drive rotation. One gap (between the bottom and middle rolls) takes the bar in one direction while the other gap (between the top and middle rolls) takes the bar in the other direction. To move the bar from the elevation of the lower gap to the upper gap a tilt table can be used. Other methods of moving the bar are also being used, such as, a lift table that moves the whole table up and down. In two high roll stands either one of the roll (top or bottom) or both the rolls are driven. In case of three high roll stands, either one or two rolls are driven while the balance rolls rotates by friction. In case of two rolls being driven in a three high stand, usually the top and bottom rolls are driven, while the middle roll is friction driven. Torque and power are the two important component of rolling. Torque is the measure of the force applied to the rolls to produce rotational motion while power is applied to a rolling mill by applying a torque to the rolls and by means of work piece tension. In a rolling mill the power is spent principally in the four ways namely (i) the energy needed to deform the steel, (ii) the energy needed to overcome the frictional force, (iii) the power lost in the pinions and power transmission system, and (iv) electrical losses in the various motors. Generally a single drive is used in a small and medium sized rolling mill with cross-country lay-out for all the rolling stands. In case of a roughing stand up-stream, the roughing stand may have a separate drive. The drive consists of (i) electric motor of sufficient capacity, (ii) drive belts, (iii) fly wheel, (iv) set of gears, (v) pinion stand and (vi) couplings. Generally AC (alternating current) motors are used in these mills since speed control is not an important issue for such mills. Rolls are normally the main and very costly consumables in a rolling mill. The rolls are used to roll steel in the rolling mill and their performance depends on many factors which include the materials used and the loads to which they are subjected to during service. The roll design is influenced by the limitations applied by the rolling load, the roll strength and the torque available for rolling. The material of the rolls is to be capable of withstanding loads which plastically deforms the rolling stock without itself being plastically deformed. Whether iron rolls or steel rolls are to be used in a particular roll stand depends on the specific duty they have to perform. The iron rolls can be grey iron rolls, alloy iron rolls, clear chill or definite chill rolls, composite or duplex rolls, indefinite chill rolls, or spheroidal graphite iron rolls while the steel rolls can be cast steel rolls or forged steel rolls. The important properties to be considered for the selection of rolls include toughness, resistance to thermal cracking, shock loading, or hard wearing. The selection of any particular roll depends on issues such as production demands, initial cost, and specific qualities required etc. Close collaboration with the roll manufacturer is desirable to ensure that these requirements are satisfied as far as possible. Shaped products are rolled between grooved rolls. Grooves are cut by a roll turning machine on mating rolls. These grooves form passes through which the steel material is passed to obtain the aimed cross section. Before getting the final shape, the steel material being rolled goes through many passes. Roll passes are classified as (i) roughing pass, or break down pass, (ii) leader pass, and (iii) finishing pass. Roughing passes are intended to reduce the cross-sectional area. Leader passes gradually brings the cross section near to final shape while the finishing pass provides the steel material its final or the required cross section. Rolling is carried out between grooved rolls. Two opposite grooves in the collaborating rolls form a pass, which corresponds to a work piece’s cross section shape expected after the pass. After every pass, the cross section decreases and its shape becomes closer to a shape of the final product. Development of subsequent pass shapes and its proper location on the rolls is called the roll pass design. Rolls are required to carry out the heavy work of reduction of the cross section of the steel being rolled. Rolls have to take all kind of stresses, loads from normal and abnormal rolling and which are changing with the roll wear during a rolling campaign. Further rolls are expected not to break, spall, or wear. They are also expected to give excellent performance without causing any problems. Under the conditions of rolling, the contact area of the roll that comes in contact with the steel suffers wear, while other parts of the roll body and roll necks does not experience plastic deformation or fatigue but are under high loads. In the recent past, the rolling technology has improved and changed a lot but rolls have always remained the critical part of the rolling mills. Rolls are the tools of the rolling mill and are the costliest consumable in a rolling mill. The way the rolls are used to execute their duty of deforming steel is in many cases largely determined by the roll pass design. The purpose of the roll pass design is (i) production of correct profile within tolerance limits with good surface finish (free from surface defects), (ii) maximum productivity at the lowest cost, (iii) minimum roll wear, (iv) easy working, and (v) optimum energy utilization. The accuracy and speed of working and roll life are all related to the roll pass design and the choice of the roll material. The rolling sequence of a roll pass design is subject to the limitations applied by the rolling load, the roll strength and the torque available for rolling. Roll pass design is also to ensure that the physical dimensions and material of the roll are capable of withstanding the heaviest loads arising during the rolling sequence. The material of the roll is important since it must be capable of withstanding loads which plastically deforms the rolling stock without itself being plastically deformed. In the rolling of hot steel, this is not a difficult problem and iron or steel rolls are suitable if they are operated at a temperature considerably lower than that of the rolling stock. The choice of roll material whether cast iron or steel (cast or forged) depends on the specific duty the rolls are to perform and the important properties such as surface toughness, resistance to thermal cracking or shock loading or hard wearing properties. The selection of any particular roll depends on production demands, initial cost, and the specific qualities required. The roll material is important to estimate the loads which the rolls must withstand. In addition it suggests what mill size is most suitable for given ranges of products so as to ensure reasonable efficiency in working the mill. Perhaps one of the most important single factors where roll life is concerned is the wear properties of the roll material. Rolls for their smooth rotation as well as for resistance to different forces need ‘bearings’. Roll bearings are to meet the basic need of the rolling mill which is the smooth rolling of the steel products. They are friction reducing devices which provide support to the rolls for effective rolling with minimum of energy loss. The bearings are to be designed to withstand high rolling loads, heavy shocks, varying speeds, and high temperatures. Apart from this, bearings are also to be designed to endure ingress of scale, dirt, and water. They play important role in reducing the power consumption and improving the rolling condition. The roll bearings, in which the rolls in roll stands are supported, are subjected to high loads. The specific loads are also high. In order that the bearings can reliably support the rolling forces, they are to have high load carrying capacity. On the other hand, the mounting space available for these bearings is restricted, especially in relation to the section height of the bearings. Mill bearings are sized to resist to the separating force at rated rotation speeds. The bearing type and style determine the mill stand capacity. Slider bearings (gun metal or fibre) or roller bearings are the bearings which are most commonly used in small and medium sized long product rolling mills. During the hot rolling of steel, heat is transferred to the rolls. If not cooled, the heat buildup causes increase in the temperature of the roll to a temperature equal to that of the stock being rolled. At this stage the roll would also undergo plastic deformation. To remove the heat from the roll, cooling water is applied. The application of cooling water is to be controlled so that the water does not fall on the rolling stock at the entry point to the rolls. In case it happens, it only cool the rolling stock, create steam pockets between the roll and the rolling stock, and waste water that could be better used on the other side of the roll. To minimize roll wear, roll cooling water must be applied as close to the point where the rolling stock leaves the roll. The cross country rolling mills of small and medium size normally use entry and exit guides of sliding type which are also known as static guides. The design of these guides is based on sliding friction. These guides are usually comprise of a guide box, two opposed blocks mounted in the guide box on opposite sides of the mill pass line and having longitudinally extending channels in their adjacent faces, separate metal plates bridging the respective channels and shaped to fit closely against the sides of the rolling stock traveling through the guide, and means to circulate water through the channels in contact with the outer surfaces of the plates. The major auxiliary equipments associated with the small and medium size rolling mills are given below. Descaling equipment – In place of high pressure water jet system a pinch roll is used in some of the mills to break the scale so that it can fall down before rolling in the first roll stand. For the movement of rolling stock some of the mills use roller conveyors. Some of the mills use transfer grids or skid transfers for the lateral movement of the rolling stock. Cooling bed – cooling bed used in these types of mills is of sliding type and is capable of accommodating one full length of the bar. The bars are cooled on the cooling bed through natural cooling by atmospheric air. There are three places where shears are used in these mills. Some of the mills use cold shears which cut the feed material to the furnace so that it generates only single cooling bed after rolling. In some other mills the feed to the furnace accommodates double the length of the cooling bed. This material is rolled in the roughing stand and the hot rolled bar is cut into two pieces by hot shear and then is fed to the cross-country mill to obtain cooling bed length after rolling. In all the cases, the cooled bar from the cooling bed of the rolling mill is taken to cold shear for end cuttings and for cutting of the bar to standard length. After shearing the bar is sent to standard length pile or the assorted length pile where it is allowed to cool down further to ambient temperature. After cooling the product is either piled or bundles and tied for dispatch to the customers.